All the features you want, with just a couple of minor drawbacks. 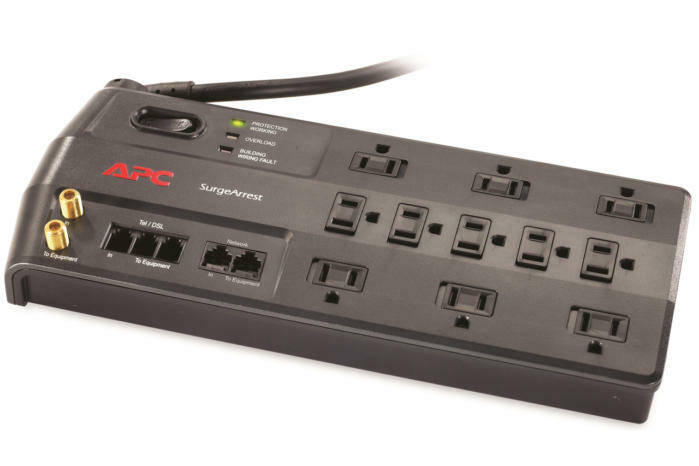 The surge protector runs five outlets for standard 2- and 3-prong plugs down the middle, and then on either side has three outlets perpendicular to the center plugs and widely spaced. I was able to attach six power adapters of varying sizes and five plugs down in the middle with only a little cramping. Some of the bonuses include not just one or two LEDs to indicate status, but three, plus an easily reachable circuit breaker reset, in case a surge knocks out power to the whole unit. A Protection Working green LED remains lit while some of the device’s MOVs are active (but more on that in a moment); a Building Wiring Fault indicator lit red would tell you to immediately call an electrician about a faulty ground or other problem; and an Overload light says you’re trying to pull too much wattage and need to remove some hardware. 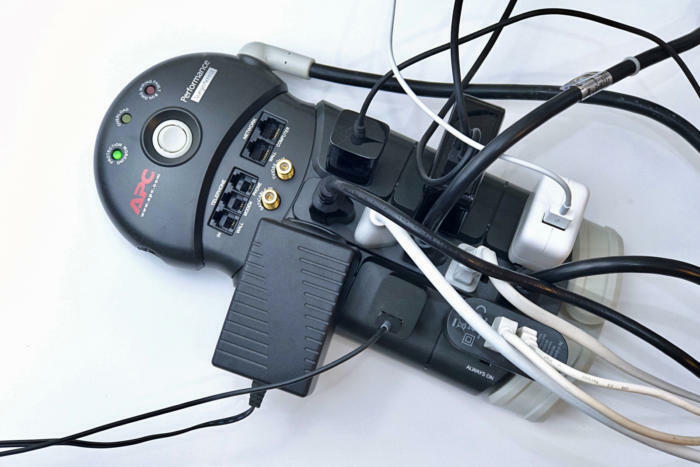 The APC SurgeArrest provides three LEDs to inform you of its ability to protect the devices plugged into it, to warn you if it’s not plugged into a grounded circuit, and an overload warning if you try to draw too much power through it. Another extra is the clever design of its power cord. At the point of attachment, APC has a 180-degree pivot instead of an inflexible point, which makes it easier to wall mount or find a good position to route its cord. One more nice touch: three of the outlets are always on and labeled as such, even if the power switch is turned off. That might be a problem if you don’t want that on any outlets. Almost all surge protectors either turn off a protected indicator when the internal circuits are burned out or have a setup where power stops flowing in that case. APC made an odd choice to do both—and neither. For the line-neutral (L-N) leg, for which APC clamps voltage at 400V, when protection ends, power stops flowing. That’s sensible, as this voltage passes through your device directly, and it’s the most likely point of failure. At 3020 joules, the SurgeArrest provides the right amount of durability relative to other products and its cost. The device includes a $100,000 lifetime warranty, but the details are hard to find: they’re noted in the manual with a link, but the link is dead on APC’s site. While this model includes coaxial and telephone line passthrough filtering, we don’t see any advantage in using either, based on industry reporting and testing. It’s not a plus or minus, and the surge protector’s cost relative to others doesn’t seem inflated by their inclusion. APC’s odd choice about power flow through makes the unit neither fish nor fowl if one of your criteria is either power always flowing or never flowing when protection ends. It’s higher clamping voltage isn’t worrying, but given that other similarly priced units are rated at 330V for the main leg or all legs, it feels slightly underfeatured. Nonetheless, the SurgeArrest has a solid set of features and 11 outlets with good placement for six power bricks should meet many needs, especially for a home-entertainment system in which most plugs are appliance size.